Bounce Back playground surfacing tiles provide a clean and safe play area for kids to play on. They are perfect for playgrounds with swings, slides, and other equipment from which a child could fall. Playground surfacing is available in many thicknesses up to 4 inches that provides a 10-foot fall height rating. Bounce Back cushions meet and exceed the requirements as established by the Consumer Product Safety Commission (CPSC) and Americans with Disability Act (ADA) and American Standard for Testing Materials (ASTM) methods. Testing of this product is done on a regular basis to maintain the highest quality standards available. Bounce Back tiles provide long-term safety, while offering ADA accessibility when used with our special ADA border ramp edging. In the past, harmful objects such as broken glass have been found mixed into wood chips or loose filled products like sand or gravel. Our playground tiles eliminate this risk. The solid construction of playground surface tiles does not allow foreign objects a place to hide on the playground. Also, solid rubber playground safety tiles stay in one place and maintain a consistent fall height rating. This is better than loose fill where continual raking is necessary to keep the surfacing in place. These playground surface tiles are a shock-absorbing, resilient rubber that will perform all year round and in all weather conditions for years. They are designed for continuous usage even during the rainy season. Water will not puddle on the surface of the tiles but moves quickly through the surface and laterally through the legs of the cushions. This makes the playground area dry and ready to use quickly after even heavy rains. 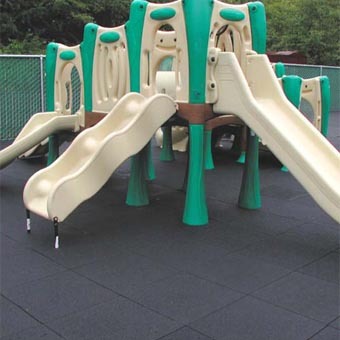 This product features colorful EPDM mixed color options that will enhance the appearance of any playground surfacing. Seven popular colors are available to make your playground look fantastic. These playground surface tiles are easy to install. Please request installation instructions. No daily maintenance is required to maintain safety standards. This means lower costs and fewer hassles. It looks and performs great! Please note: These tiles are specifically designed to lay on a flat, hard surface such as concrete or a base of crushed and compacted stone. They are NOT designed to lay directly on top of dirt. If you’re looking for a playground safety surface that can lie on dirt, we recommend our Kids Ergo Matta. Bounce Back rubber playground tiles are Earth friendly. Each 24″ x 24″ safety tile is made from scrap tires that would otherwise be buried in a landfill. Bounce Back rubber can be recycled again and again. These tiles are made in the USA. If you have questions, would like a sample, or are looking for a quote that includes shipping to your playground area, give us a call. One of our friendly customer service reps would be happy to help you with any questions or concerns you might have.